Chicken Machboos is the national dish of Bahrain. A spiced chicken and rice dish, this recipe is thoroughly authentic and guaranteed delicious. 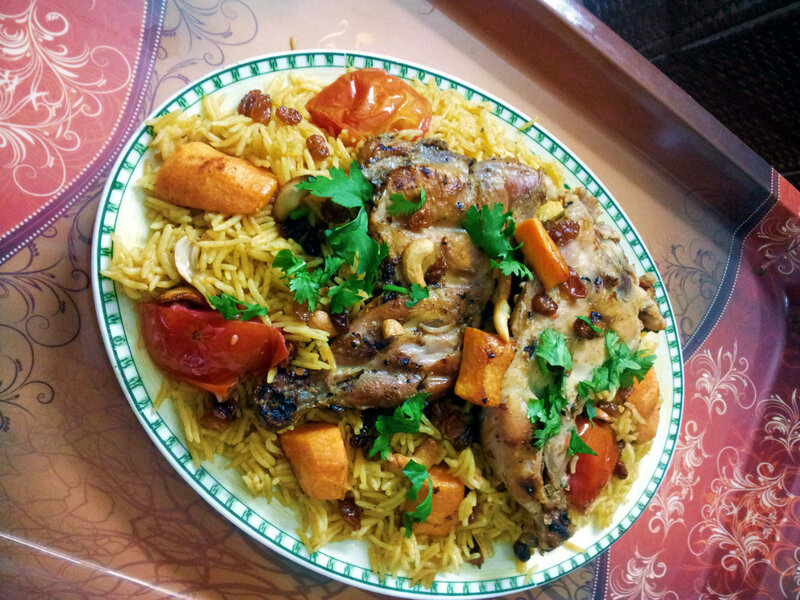 Chicken Machboos is a popular dish in many Gulf countries & across Saudi Arabia. Here is a version that is traditionally made in Bahrain. Grind the garlic cloves, ginger, green chili, mint leaves and half of the coriander leaves. Soak saffron in rose water. Soak the rice. Slice and then fry the onions lightly brown. Add the ground ingredients and fry well. Chop the tomatoes and the chili pepper and then add them followed by tomato paste and the green cardamoms, cinnamon, crushed dried lemons, black pepper, chili powder, Bharat powder, turmeric powder and crushed bay leaves. Fry the spices and add the chicken pieces. Add salt and enough water to cover the chicken. When the chicken is done (slightly soft), add the rice in and slowly stir adding the remaining coriander leaves and enough water to cook the rice. Be very careful when adding water because if you add too much the rice will be very soft. Add the saffron soaked in rose water, slowly stirring. Cover tightly and keep covered while cooking on low heat for 25-30 minutes. Before serving stir the rice using a fork to separate the rice grains. The chicken should be intact. Garnish the dish with fried nuts, raisins and carrots.